Dragon with his then-wife, Toni Tennille, 1976. Daryl Frank Dragon (August 27, 1942 – January 2, 2019) was an American musician and songwriter, known as Captain from the pop musical duo Captain & Tennille with his then-wife, Toni Tennille. Born into a musical family, Dragon was the son of Eloise (Rawitzer) and conductor, composer, and arranger Carmen Dragon, and the elder brother of Dennis Dragon, a member of the 1960s pop combo The Dragons and the 1980s surf band the Surf Punks. His godfather was actor and comedian Danny Thomas. Dragon's familiar image and stage name came from his time as a keyboard player with The Beach Boys from 1967 to 1972. Beach Boys lead singer Mike Love gave him the nickname "Captain Keyboard", and it stuck; Dragon began wearing a nautical captain's hat to go along with the name. As Captain in Captain & Tennille, Dragon was frequently silent and a man of very few words, playing a foil to his outgoing, vivacious wife, Toni Tennille. In 1968, Dragon and his brother Dennis formed a studio band called The Mission, which produced a one-off single on the small Bet Records label: "Calmilly"/"Galing Made It". The songs later appeared on a joint album in 1971 titled Me and My Brother (aided by another brother, Doug, who sang the vocals), which was released on CD in 2005. In the late 1960s, Daryl and his brothers Doug and Dennis recorded sessions for a psychedelic soul/rock album as "The Dragons", but they were unable to get a record label to release the album. The album was titled BFI, which stood for "Blue Forces Intelligence". In 2007, UK label Ninja Tune discovered that the recording engineer, Donn Landee, still had the master tapes and they released the album. On the double LP The Visit by Bob Smith, released in 1970, Dragon is credited as Captain Keyboard. Dragon also made significant contributions with keyboarding and musical scoring on the Beach Boys' 1972 release Carl and the Passions – "So Tough"; he co-wrote the track "Cuddle Up" with Dennis Wilson. Also, Dragon's orchestrations on the tracks "Make It Good" and "Cuddle Up" translated the melodic ideas that Wilson was seeking. Additionally, Dragon arranged the coda on "Don't Go Near The Water" from the Beach Boys' 1971 release Surf's Up. A plaque featuring Dragon's name was unveiled by Roger Williams University at the Baypoint Inn & Conference Center in Portsmouth, Rhode Island on Thursday, September 21, 2017, honoring the Beach Boys for a significant historic event in their career - the band's concert on September 22, 1971 at The Ramada Inn in Portsmouth, RI. The concert was the first-ever appearance of South African Ricky Fataar and Filipino Billy Hinsche in the band, essentially changing the Beach Boys' live act into a multi-cultural group. Dragon served as musical director for the 1971 concert. Dragon contributed vibes and melodica in the song "Wind 'n' Sea" by the band Farm, a group assembled by Dennis and Doug for the soundtrack to The Innermost Limits of Pure Fun, a surf film directed by George Greenough. He also did session work with Dennis for the Go for It soundtrack and, in the early 1980s, with the rock band Survivor. In 1981, Dragon contributed to Carpenters' Made In America album, programming synthesizers on "(Want You) Back In My Life Again". In 1996, Dragon played keyboard on a number of tracks on the self-titled album by pop punk band Size 14. In late 2009, Toni Tennille announced her husband had developed familial tremor. According to Tennille, his condition was neither debilitating nor terminal. Rather, his noticeable tremor was exacerbated by stress and anxiety. Subsequently, the tremor condition limited most of Dragon's public appearances. As of November 2009, Dragon was under a physician's care to determine the best method of treatment. In September 2010, Tennille publicly clarified her husband's condition as "a neurological condition (later confirmed to be essential tremor), which causes him to have tremors". Tennille indicated the condition was debilitating to Dragon's abilities as a musician. Tennille filed for divorce from Dragon in Arizona on January 16, 2014, after 39 years of marriage. Dragon stated he was unaware of this until he was served with the divorce papers. Dragon, contacted by TMZ on January 22, 2014, stated: "I don't know why Toni filed for divorce." On January 23, 2014, The Washington Post reported health insurance related to health issues might be the reason for the divorce, as both issues had been referenced in divorce documents filed with the courts. Tennille had reported on her blog in 2010 her husband's neurological condition was characterized by such extreme tremors he could no longer play keyboards. The divorce was finalized in July 2014. In her memoirs, Tennille described their marriage as loveless and lacking physical affection. Regarding his ex-wife's new memoirs, Dragon stated, "No, I haven't read it." In an interview on March 17, 2016, Dragon, responding to the book by his ex-wife, would comment only, "I was drugged (at the time of his divorce), that's all I can tell you." On April 12, 2016, while appearing on the Today show, Tennille confirmed her divorce from Dragon was finalized, and stated that the reason for the divorce was Dragon's "inability to be affectionate". Tennille later said that Dragon had reacted positively to the Today segment and told her; "I saw you on The Today Show. I was proud of you." In an interview published in a February 2017 issue of People, Dragon stated he was making great progress and feeling like himself again, after corrections were made in the dosage of medications he was taking, which were causing side effects. Dragon stated his ex-wife had flown to Arizona and had been a help in his improvement. Dragon died on January 2, 2019, from kidney failure in Prescott, Arizona, aged 76, with Tennille by his side. ^ a b Sandra Gonzalez (January 2, 2019). "'Captain' Daryl Dragon dies with Tennille at his side". CNN. Retrieved January 3, 2019. ^ Profile, Music-enthusiast.com; accessed August 24, 2016. ^ "The Santa Fe Magazine". Santa Fe Magazine. January 3, 2019 – via Google Books. ^ "BFI by The Dragons". Ninja Tune. ^ "When the Beach Boys rocked Roger". September 20, 2017. 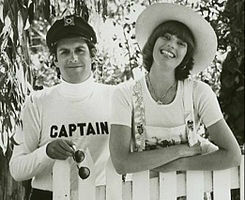 ^ ""The Captain & Tennille" Home Page". Captainandtennille.net. October 29, 2011. Retrieved February 8, 2012. ^ Dahms, Heidi. "Tennille, 'Smoky' bring new smiles; hospital patients get visits from pop music icon, her dog". Dcourier.com. Archived from the original on February 23, 2012. Retrieved February 8, 2012. ^ "TONI'S TAKE". Captainandtennille.net. Retrieved February 8, 2012. ^ Ramisetti, Kirthana (January 22, 2014). "The Captain & Tennille to divorce: Powerhouse '70s duo split after 39 years of marriage". New York Daily News. Retrieved January 23, 2014. ^ Lovece, Frank (January 22, 2014). "Daryl Dragon, Toni Tennille of Captain & Tennille to divorce after 39 years". Long Island Newsday. Retrieved January 23, 2014. ^ "Captain and Tennille, musical duo of the '70s, divorcing after 39 years of marriage". The Washington Post. January 23, 2014. ^ "Toni Tonille: Her Happy Marriage With the Captain Was a Lie". The Washington Post. April 6, 2016. ^ a b Dawn, Randee (April 12, 2016). "Toni Tennille reveals the personal reason why she divorced Daryl Dragon". Today. ^ "Captain & Tenille Singers In Vicious Post-Divorce Battle Over Explosive Tell-All Book". Radaronline.com. March 30, 2016. Retrieved August 17, 2017. ^ Tennille, Toni (May 7, 2016). "TONI TENNILLE! Love Will Keep Us Together! Creative Arts Emmys 2016". YouTube.com. Retrieved May 11, 2016. But I do know this ... He said 'I saw you on The Today Show. I was proud of you.' And Caroline was with me in the back of the car and we both kinda teared up a bit. He is proud of me, and he's proud of the music. ^ Chiu, Melody (February 11, 2017). "Daryl Dragon of Captain and Tennille Clears Up Rumors About His Health: 'I Am Not Under Hospice Care'". PEOPLE. Retrieved August 16, 2017. This page was last edited on 24 March 2019, at 12:16 (UTC).